A friend sent me this recipe yesterday. It’s called Cocoa Cheesecake Streusel Bars and it’s adapted from Penzey’s Spices. At first I thought these were just another version of cream cheese brownies, but the bars are a little different. Preheat oven to 350. Line a 13x9 inch pan with non-stick foil or parchment. If you prefer not to line the pan, that is fine. Combine flour, sugar, and cocoa in a large bowl and then cut in the butter until crumbly and rather dry. This can also be done in a food processor. Reserve 2 cups of the mixture for the topping, then press the remaining into the bottom of prepared pan. Bake crust for 15 minutes. Beat cream cheese until fluffy, then gradually beat in condensed milk until smooth. Add egg and vanilla. Pour cream cheese mixture over crust. If using nuts, combine with the 2 cups of reserved chocolate mixture. Sprinkle over cream cheese mixture. Bake 25 minutes until bubbly. Sprinkle chocolate chips over top as soon as you remove from oven. Chill thoroughly. Lift from pan by grasping foil or parchment, then cut into squares. Note: You can halve the recipe and make it in an 8 inch square pan. Halve everything, use two tablespoons of egg and cut about 2 minutes of each cook-time listed. Just made these bars and they are delicious! Easy recipe yet stunning results! Those chocolate chips look impossibly large! Yum! I have to bake something for Al’s company party next week. I have been looking for something simple and now I’ve found it. No wonder I couldn’t find it. I’ll go ahead and change the name and add the link in the text. Here is the link to the recipe on Penzey’s site. 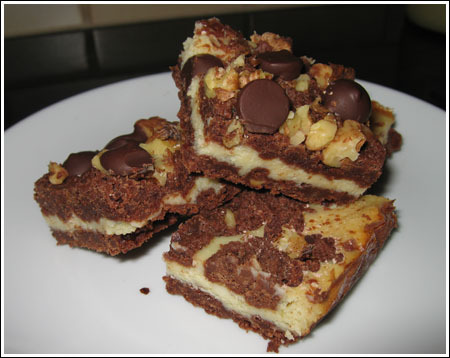 It is called Cocoa Streusel Cheesecake Bars. Cookie Monster, I didn’t see it on their site. Do you have a link to the original Penzey’s recipe? I can’t wait to try those brownies! I have had your site featured on mine for several weeks. I love it! Yum. I have to put those on my to-try list. If you & Val both like it, it’s a sure thing. Plus I’ve had very good luck with Penzey’s recipes. Mmmm! These look good. Different textures and tastes all in one. Thanks again for sending. I am always looking for ways to use half a can of condensed milk and this is a good one. I halved the recipe too, but I spaced out and put a whole egg in there. oops. this recipe is obviously very forgiving because they turned out fine that way.